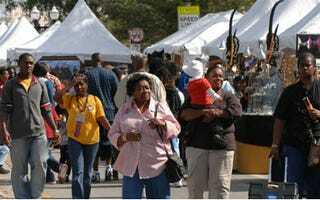 Eatonville, Fla.'s annual Zora Festival, in honor of the prolific black novelist and Harlem Renaissance writer Zora Neale Hurston, is in full gear, celebrating 23 years of arts and entertainment enrichment in one of the nation's historically black communities. The annual festival hosts a bevy of art and literary talks, gallery showcases and other exhibitions. In addition, the Zora Festival typically features a couple of popular musical acts, such as R&B stars Keith Sweat and Mario, both of whom will be rocking the stage during this year's festivities. Eatonville, an all-black town founded in the wake of the Emancipation Proclamation, and Hurston have an intimate connection, including the town's central role in the author's seminal novel, Their Eyes Were Watching God. The Zora Festival goes on until Jan. 29. For more information or to buy tickets, visit the festival's website. Previous recommendation: New Sci-Fi Thriller Starring Michael Ealy.